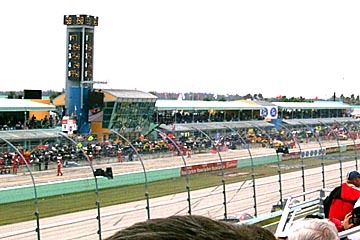 On November 17th, Rick and his friend from Italia, Pietro, took in the Ford 400, a motor race event featuring NASCAR cars at the Homestead-Miami Speedway in Homestead, Florida (about 40 miles south of Miami). 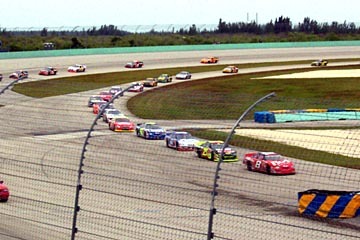 It was the last race of the season and a race in which Tony Stewart clinched his first Winston Cup championship driving for the Joe Gibbs (of NFL football fame) Racing Team in his Home Depot Pontiac Grand Prix. 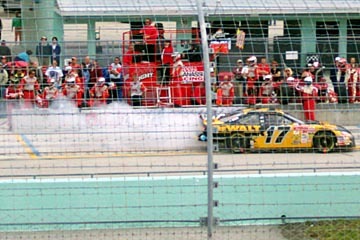 The event itself was won by Kurt Busch in a Ford Taurus. 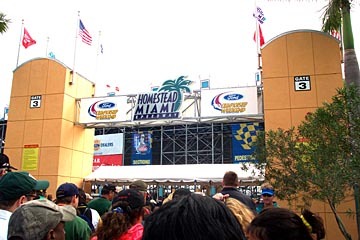 The entranceway to the Homstead-Miami Speedway. 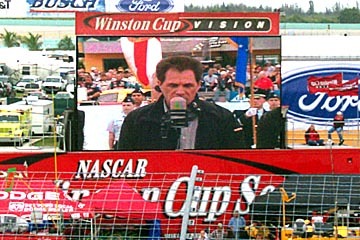 Former champion and NASCAR legend Darryl Waltrip reads the pre-race prayer. 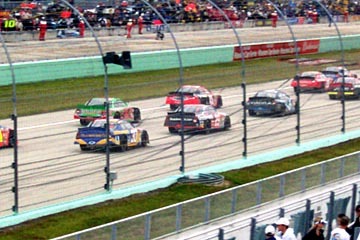 Jumbo TV screens abounded at the Homestead-Miami Speedway. 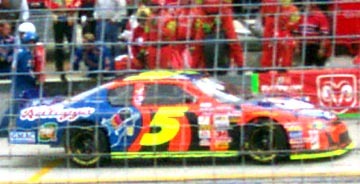 Rain threatened the entire day, and before the race, the cars were festooned with colorful covers. 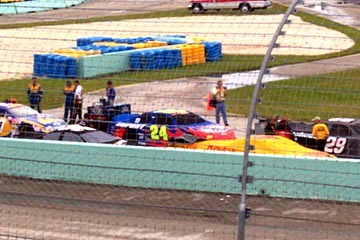 I bought seats on the main straight, closer to the tumultuous Turn 4 exit. The view all around the track was excellent from our perches. 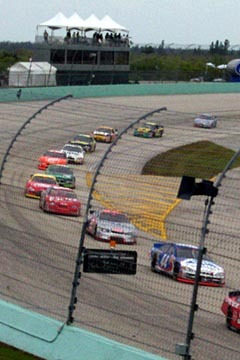 The cars resembled Miami traffic as they took several pace laps on the somewhat damp tarmac. Much respect must be given to the cars' brave pilots, who compete for 400 miles inches away from one another at over 190 mph! To those about to RACE, we salute you. 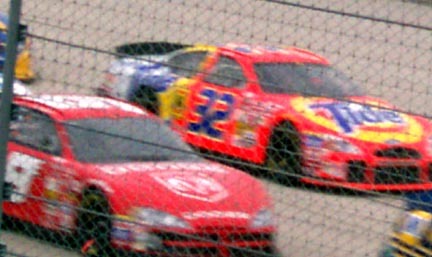 Bill Elliott ("Awesome Bill from Dawsonville") in the Dodge speeds alongside Rick Craven in his Ford Taurus. Pop music's Britney Spears was on hand for the day's festivities; she's starring in a feature film about NASCAR due next year. 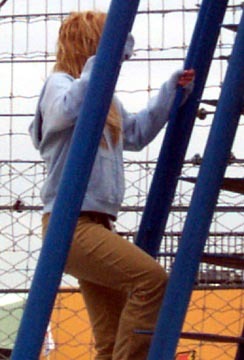 Ms. Spears descend's the start-finish line's flag tower. Meanwhile, Dave Blaney's car suffers problems. 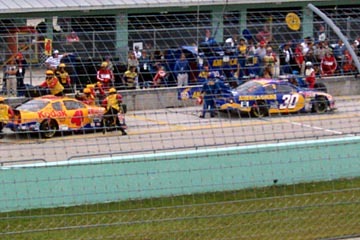 The yellow caution flag prompted quick pit stops; this line of cars is led by Dale Earnhardt Jr.
Matt Kenseth's crew attends to his DeWalt Ford Taurus. NASCAR is more of a "team" sport than NBA basketball, say some. 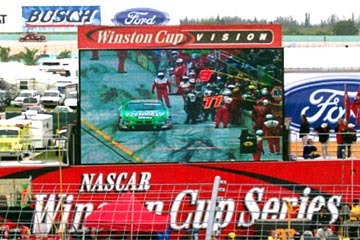 Looking at this pit stop of Mike Skinner (4) and Jeff Green, the intelligent sports fan might concur. 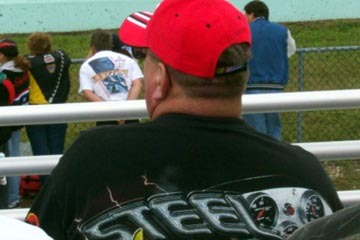 Yes, there were "rednecks" at the race, like this gentleman whose T-shirt proclaimed, "A Body of Steel"
Terry Labonte's Ford Taurus, which is sponsored by Kellogg's, is a representation that NASCAR truly is a family sport. 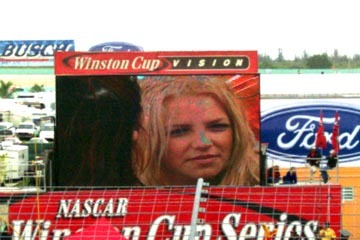 This "woman" screamed her head off for the entire race, rooting for Mark Martin's Viagra Ford Taurus.